"Every man has a point that defines him." As spoken in Captain Abu Raed, those words are meant to be threatening, said by an angry, abusive father to a frightened son about to be punished for stealing. But by the film's end, those words have taken on a completely different meaning, as the film examines the nature of heroism and the effects a man can have on the lives of others. 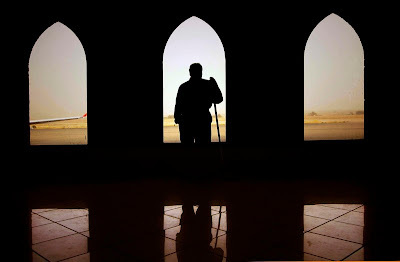 Abu Raed is an elderly janitor (wonderfully played by Nadim Sawalha) working at the Amman airport in Jordan. His wife has been dead for several years, and he is spending his twilight years alone in a lonely hovel in a run down neighborhood in an impoverished side of town. His life takes an unexpected turn one day, however, when he finds a pilot's hat in an airport trashcan and wears it home, and is mistaken for an airplane captain by a neighborhood boy. Abu Raed at first dismisses the boy's fanciful questions, but as more and more children begin showing up at his front door, he decides to indulge their fantasies and become Captain Abu Raed, regaling them with tales of his wild adventures all over the world. He becomes a hero to all the neighborhood children, even after reality makes a hard and dangerous appearance. It would be easy to accuse the film of having a sentimental streak a mile wide, and indeed it is a nostalgic, fable-like ode to childhood, often shot in warm, sunny hues. But unlike many films in which this is the case, Captain Abu Raed allows for something deeper. There is very much a sense of childlike wonder inherent in the film, with moments of sublime beauty and innocence, but it does not ignore the darker elements of reality in its quest to present a child's view of the world. Director Amin Matalqa captures a rare sense of awe at life's simple pleasures, be they riding in a car with your hand out the window, allowing the wind currents to give you the sensation of flying, or just lying down and staring at the sky, and imagining what it must be like to soar through the heavens. These are simple people with simple goals, and Abu Raed brings these children a magic they may not otherwise have had. It is most interesting looking at Captain Abu Raed, and its surprising similarities to another current film, Clint Eastwood's Gran Torino. While wholly different in execution, the overall themes are not altogether dissimilar; a lonely old man with a bit of a grumpy streak who is transformed by neighborhood children, and in turn affects their lives in ways none of them could have ever imagined. Abu Raed is ultimately the more sentimental of the two films, and while I would probably give Gran Torino higher marks overall, Captain Abu Raed probably had a more profound emotional impact on me. True, there are moments that lack directorial polish, but Matalqa delivers some truly masterful moments here. There is a long shot later in the film of a Abu Raed climbing a long flight of stairs alone, that may be quite possibly one of the most stirring and heartbreaking shots in recent memory. Crying in movies is something I do quite often. It really doesn't take much. 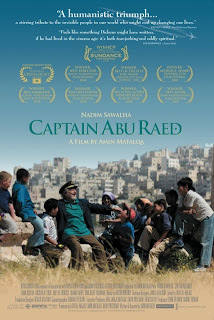 But it is rare for a movie to bring on the tears the way Captain Abu Raed did. When the film ended, I just sat on my bed and cried through the entire end credits sequence. That's how profoundly touching it is. And its emotional impact is achieved not through manipulation or ridiculous plot twists, but through the simple idea of heroism, and how one person can affect the lives of others. It almost takes on a power reminiscent of Cinema Paradiso, and coming from me that is high praise indeed. Every man has a moment that defines him. And for the children in this poor neighborhood in Amman, there was Captain Abu Raed. A man who was never who he said he was, but ended up being so much more. It is a beautiful, tender tale that not only sneaks into the hearts of the audience, but may well be a definining moment in Jordanian cinema. Yes, and I remember that posting from months back. I expressed interest in the film, and it will at last be available. Wonderful review. I saw this film several months ago and it has stayed with me. I wasn't as emotionally moved as you were to the point of crying but it still had an impact on me. Would like to see it again on DVD. Coming Soon: "The Burning Plain"
On "Harry Potter and the Half-Blood Prince"
Review: "A Woman in Berlin"